No limits seems to be the only rule for the collective KTZ, more simply, the current reinterpretation of Vivienne Westwood’s style. But forget about the Lady of Punk. KTZ, the trio who hides his identity behind three letters, has a even stronger philosophy. They are Koji Maruyama, Marjan Pejoski and Sasko Bezovski and they graduated in Fashion Design and Architecture at the prestigious Central Saint Martins in London. The mastermind behind the idea, Sasa, moved to England in 1989 to develop his projects. 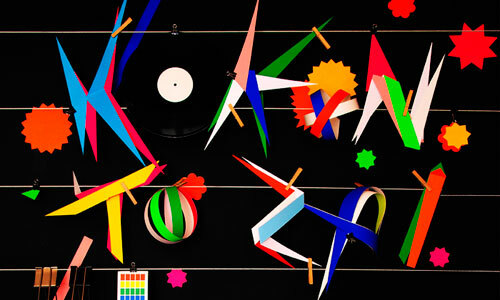 In 1996 he opened the first boutique named Kokon To Zai, conceived as a creative space for artists, designers and DJs. 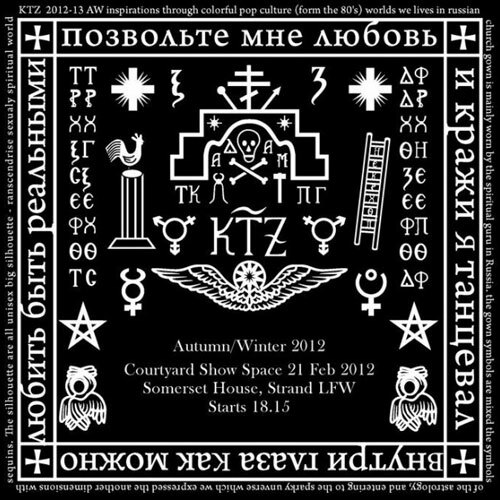 In a short time the space became the right place to go and later, in 2010, became the basis for the fashion brand KTZ. The KTZ’s collections have distinguished for a strong individual and visionary sense and have evolved with the sole aim of finding new weareble forms, new visually magnetic patterns and elaborated stylistic cuts. 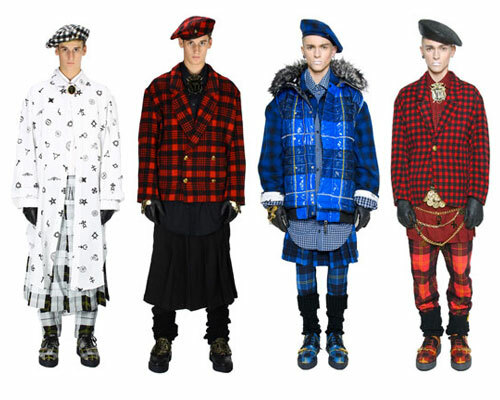 The 2012 F/W collection, inspired by a fictional character from Kenya devoted to meeting odd people, is full of tartan, plaid cross, chains, stars and religious symbols. 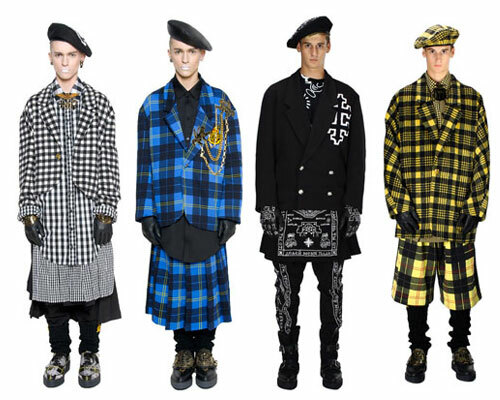 Among kilt, pants and oversize jackets, the 90’s revive with a touch of punk and a rap attitude. Pure extravagance for eyes and style, KTZ has no fear of exaggerating in fashion but prefers the eccentricity and pays attention to the details. So berets and caps, bags and purses, boots and talismans-like jewels are back in vogue. The bright colours such as red, yellow and blue interact in a mystical and pop evocation with white and black. The pagan symbols make themselves noticed between the overlapping layers, appearing harmonious among the severe clothes as uniforms. 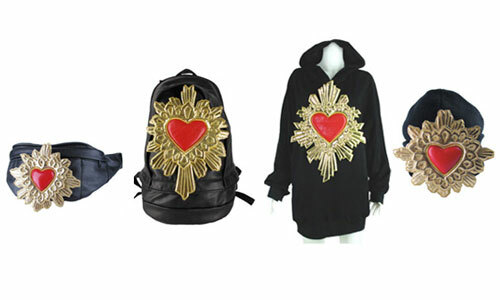 KTZ is an avant-gardistic baroque in terms of luxurious exuberance and harmonious elegance. It’s a game of irreverent style, it is the imaginary encounter between different cultures. After a long journey in time, the collection explodes into overlapping shapes, prints and bright colours. The ornate lines, the cheeky taste and the rebellious style, don’t leave out the casual hints and the bon-ton attitute, so they find a place in the wardrobe of the most daring common people or of the stars who love streetwear. A special attention is payed to the limited edition of an ex voto in red leather and gold, applied on a sweatshirt, on a backpack and on a black leather carrier. The result is an intense and hypnotic mix between the Maasai and the punk cultures, and the digital printing: hence the name of the collection, “Maasai Punk”. 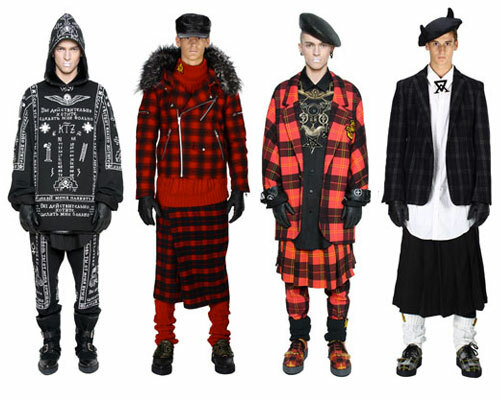 KTZ is a wild scream on the catwalk and a multifaceted style from which it is impossible not to be won over.